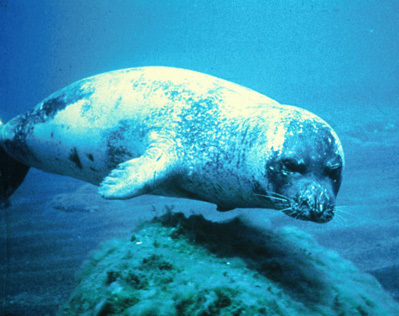 Mediterranean Monk Seals are the second rarest pinniped in the world and are associated with the Phocidae family. They have long bulky bodies and can swim or dive with ease. Being extremely sensitive to humans, they have confined themselves to undersea caves. Habitat loss and killings have reduced its population to around 600 at present, making them a critically endangered species. Size Adult seals grow as long as 2.4 meters and at birth they measure around 80 cm. Weight: Pups are around 16 to 18 kilograms, whereas the adults can weigh around 300 to 400 kilograms. Color: The pups are born with long, black or dark brown colored hair on their skin with white marks on the belly. Adults too have black fur but the females have grey or brownish fur on them. Looks: It has a flat and short snout with elongated nostrils, directed upwards that are very prominent. They have short flippers with tiny claws. It also has smooth, long whiskers on its face. At present, only a few hundreds of these mammals are left and are found in Madeira, Ionian Sea, Desert Islands, Turkey (southwestern) apart from Aegean Sea and some regions of Western Sahara. Although its range stretched across northwest Atlantic Africa, Mediterranean islands, Black sea shores, Madeira, Atlantic France and Portugal, they have severely diminished in numbers in the range. Migration patterns cannot be traced in this species, but they have been noted to follow the migratory routes of the fishes or travel in search of food. As evident from Black Sea Reports, these monk seals frequented areas which are rich in fishes and also followed tuna schools in their migratory phase. A shift in the type of habitat can be noticed in these sea mammals. With changing times, they have moved their base from open beaches to caves. These caves are tucked away in faraway coastlines where accessibility of humans is restricted. It cannot be seen from the surface as the entrances are located underwater. In ancient Greek civilization, these seals were always exploited for commercial, medicinal and entertainment purposes. They were also considered to be a nuisance for damaging their fish nests and were hence killed. 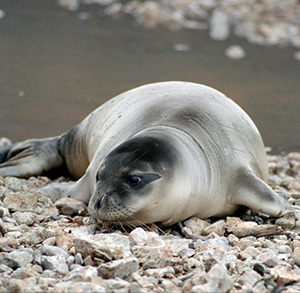 Excavations in Egypt have unearthed remains of Mediterranean monk seals alongside humans and dogs, which might be indicative of the superstition that existed among the Egyptians. They are highly efficient in hunting in oceans and can reach their prey located at a depth of almost 230 feet of the ocean floor. With time, they have completely withdrawn all contacts with humans to avoid disturbance, due to their sensitive nature. Mother and the pup communicate via specific set of sounds that are very loud. Studies have revealed that human presence can compel the mothers to abandon their pups and pregnant ones might even suffer miscarriages.. Some of their activities are influenced by high and low tides. During low tides, they can be out in the sea and during high tides they restrict their outing. They make their boundaries clear and defend those from the intruders. Although they move around single or in a group of 3, they may join larger groups for molting, which is the process of shedding their hair and epidermal layer. Two types of feeding techniques have been found to be practiced by them, one done at the surface and the other by diving deep into the ocean. Their diet consists of octopuses, eels, squids, mollusks and fishes. They prefer hunting for their prey in open spaces as they can effectively swim around. No such predator is known to exist but predation of juveniles by sharks and killer whales have been reported in some cases. As there has been massive exploitation of their natural habitats due to growing tourism, these creatures have moved their base and adapted to the changing habitats. They have developed faculties of hearing and sight which helps them in water, but this however deteriorates when they are on land. It can swim with the help of the flippers it has been endowed with. It has a furry body which keeps heat intact in its body. Mating activities have been observed in the months of September till November. During this time, males may show aggressiveness and stalk the females in other’s territories. They undergo a long gestation period (often extending to almost a year), after which a single pup is born. After around 14 days, the pups get into water and weaning is complete by the 18th week. They become adults around the age of 4 yrs and become adept at swimming in the 2nd month from their birth. Till they turn 3 yrs, they are being nurtured by their mothers, though suckling is over by the age of 4 months. They have high mortality initially as they are often swept away by the waves after being deserted by their mothers who go out looking for food. On an average, they live for almost 20 years which can extend till 45 years as well. No sub-species of these Monk seals have been reported as yet. They are not receptive in captivity as they are sensitive to human intrusion. Only orphaned pups have been captivated on temporary basis. They have been listed as Critically Endangered species by IUCN Redlist, hence they demand conservational measures that have been initiated since the late 20th century. They have been known to consume around 3 kilograms of food each day. It can locate its prey hiding below rocks in the depths of oceans by moving the rocks aside. According to legends they sleep very deep, for which they were considered to be susceptible to numerous threats. 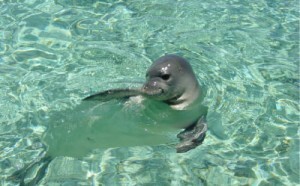 Monk seals are depicted in coins traced back to 500 BC as well as mentioned in classic literatures by Aristotle, homer and Plutarch. A colony of seals still survives in Atlantic Ocean’s Cabo Blanco. 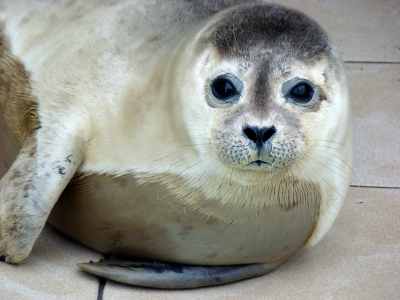 Images of this species of seal have been represented here.